These grants will contribute to the continuation of innovative high-impact science and the recruitment of young talented scientists to our teams in Dundee. Two scientists at the James Hutton Institute and the University of Dundee's Division of Plant Sciences have been awarded highly prestigious European Research Council (ERC) Starting Grants. 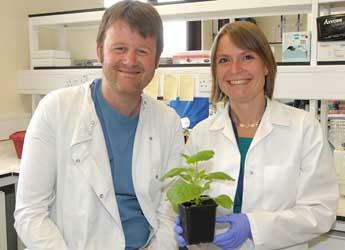 Dr Jorunn Bos of the Cell and Molecular Sciences group and Dr Edgar Huitema of the Division of Plant Sciences are based both based at the James Hutton Institute in Dundee. The grants, each worth around €1.4 million, will support their research on important pathogens and pests of crops over the next five years. Jorunn’s research team will focus on understanding the molecular mechanisms that determine aphid host range. Aphids are phloem-feeding insects that cause feeding damage and transmit economically important plant viruses to many crops worldwide. Many aphid species are restricted to one or few host plants, while some aphids, many of which are of agricultural importance, can infest a wide range of plant species. This project aims to unravel the molecular mechanisms underlying this variation in aphid host range and will ultimately lead to a better understanding of economically important plant-aphid interactions. Edgar’s grant will enable his team to use both pathogen and crop genome sequences to study disease processes in molecular detail. He explained: “Our research will help devise and apply innovative approaches that can dramatically change the ways we try to understand and combat important crop diseases. Both Edgar and Jorunn were recruited to Dundee with Royal Society of Edinburgh (RSE) fellowships to start their independent research careers. These ERC Starting Grants will allow them to further build their research teams and conduct cutting-edge science. Edgar and Jorunn both indicated that their RSE fellowships were an important step towards this success and that they are extremely delighted to have won these ERC Starting Grants to continue building their research groups in Scotland. “These grants will contribute to the continuation of innovative high-impact science and the recruitment of young talented scientists to our teams in Dundee,” Edgar added. ERC Starting Grants are highly competitive research grants that support early-career researchers to establish an independent research group in an EU member State or Associated State. The ERC Starting Grant Scheme supports research that is innovative and beyond the state of the art. Therefore, the scheme targets highly talented researchers with a strong track record and creative ideas to move science forward.